Set sail aboard the Aquarius for an exciting day of fishing that you will never forget. 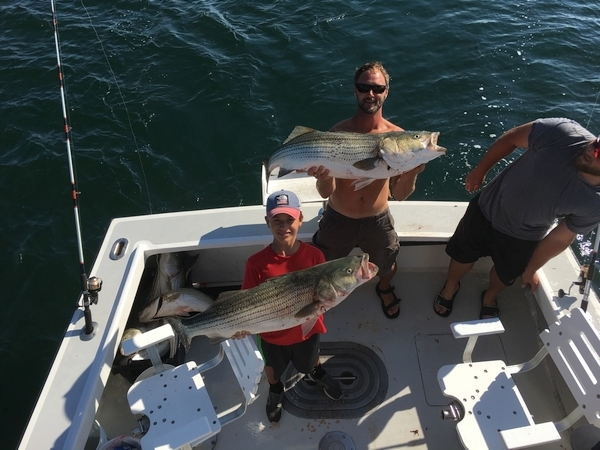 Our crew offers fishing charters for anyone who is ready to fish the historic waters of Cape Cod, arguably the most trophy-rich fishing grounds on the east coast. We know where the fish are and we go where the fish are--whether it's the famous Billingsgate Shoals or the rips off of Race Point in Provincetown. You'll relax in total comfort as we fish for trophy-sized striped bass, bluefish, giant Bluefin tuna, and sharks. Captain Jeff has over 35 years of experience fishing Cape Cod and the waters off the coast of Massachusetts. The Aquarius charter fishing boat caters to anglers of all fishing backgrounds. Catch the trophy fish of a lifetime when you book all of your fishing charters aboard our boat. The Aquarius is a an ultramodern 35' sport fisherman designed solely for the purpose of fishing, has all the modern electronics, and safety equipment needed for a great day of fishing in Cape Cod. Tell us more about the group you want to bring and the fish you want to catch on your next trip, and we’ll provide you with the information you need. We provide the right tackle and gear. 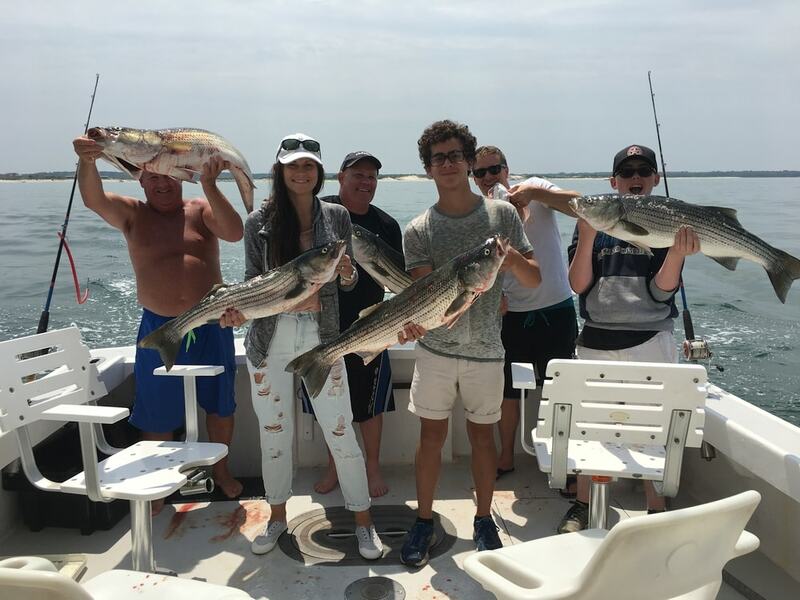 We offer striped bass and bluefish trips that are priced according to the duration of time that fits your schedule. Stay out as long as you can, or book a half-day package that has you back in time for a fantastic fish lunch. You won’t need to have a fishing license, but you will need to bring a smile and a fun attitude. 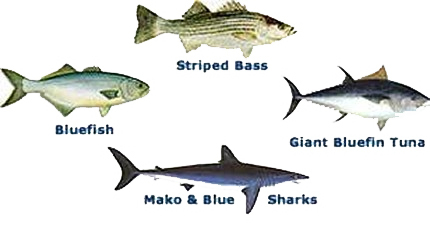 Whether you are interested in finding striped bass inshore or the Mako sharks that are available on deep sea fishing adventures, our crew is ready to serve your needs. Book your next charter today and enjoy everything that the waters of Cape Cod have to offer. Park your car just feet from the boat and set sail on a memorable journey. Enjoy the meal of a lifetime after your day of fishing with the help of our crew. While you enjoy the trip back to port, we’ll clean your catch and have it ready for the grill at an area restaurant. Fishing the fertile shoals and grounds around Cape Cod has come to define the lives of many New Englanders, and now you can share this experience aboard one of the exclusive charters offered by Aquarius Sports Fishing. We take much of the guesswork out of fishing when it comes to choosing the right tackle and timing. Our ultramodern sport fisherman is customized with accurate electronic navigation and exceptional comforts. We make the safety of our guests a top priority by equipping the boat with Coast Guard safety equipment. Experience and training matter when it comes to the teams you choose for your fishing tours. We get you to where the fish are, and safely home at the end of your trip. Contact us today for a chance at securing a trophy-sized bluefish or striped bass aboard one of our exclusive fishing charters. We offer Cape Cod fishing to customers and clients from across the nation. We've been catching some monster sharks this season. Come join us for the best Striper fishing trips, Tuna fishing charters, and Shark charter fishing trips in Cape Cod.